LBML (Little Big Mining Log) will help you track your claims and mining runs. It will record your drop locations and the claims you find. Everything can happen automatically without you having to leave the game to press buttons. The tool uses OCR (image recognition) on the mining claims you find to record their depth, size, type and position. Everything is plotted on a map so you can always return to your best spots. "I have took upon myself the task of providing the best and feature rich tool to the miners of Entropia Universe. Development started on the 21st May 2010, with the closed beta period lasting until end of February 2011. On 1st of March 2011 the public beta period begins and ended with 2014. On 01.01.2015 the project went Gold with the 1.0 Release. So far the projects provides a welcome challenge to me. I'm having lots of fun developing it and interacting with the wonderful miner community of Enropia Universe. I hope you will find it helpful in your endeavors." 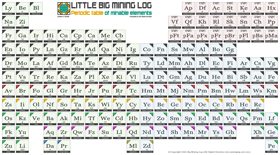 Little Big Mininig Log is approved for use with Entropia Universe by Mindark PE AB. This tool is for all of you, so your feedback is most welcome. #LBML - to join the chat channel ingame type "/j #LBML"
* If your Auto Update Process fails with an error please extract the auto downloaded zip to the program directory overwriting existing files. - Brand new map engine (full re-write) no more 800 errors! In File->Settings->Auto new mechanism to help select the proper radar size. - Note: sorry for the dalay and October/November downtime... please enjoy! - integer values i.e. "255, 255, 255"
- Hexadecimal values i.e. "#FFFFFF"
for color coding your claim deeds and player and drop colors.